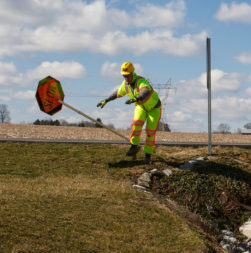 Retroreflective materials are so commonplace on job sites across the country that most people don’t think about them much beyond knowing they are a safety technology that enhances visibility. What exactly is “retroreflectivity” and how does it work? A reflective surface does not absorb light, but projects it away. In Latin, “retro” means “backward.” A retroreflector is a surface that reflects light back to its original source with minimal scattering. Retroreflective materials have been used for decades in road safety applications, alerting drivers to dangers and the people working on or near roadways. Today, there two major categories of retroreflective materials: beads and prisms. The material that pioneered retroreflection for road safety was glass beads. According to Shari Franklin Smith, a Technical Service Manager at 3M®, a leading manufacturer of retroreflective materials, glass beads were first used in the 1930s. During this period, road safety became a priority as the number of vehicles on the road increased. The beads were mixed with paint to illuminate pavement markings at night. The spherical shape of a glass bead is capable of capturing light from 360 degrees and reflecting it back to the source. This capability of reflecting light from multiple angles works well when used for materials that are not perfectly flat, such as high-visibility clothing or road paint. By the early 1960s, a new material was developed that used the reflective qualities of a prism. This became known as microprismatic technology. Prism-shaped material is stronger and measurably brighter than bead-based materials, but does not reflect as many angles as a sphere. This “head-on” reflective property works very well for flatter, more rigid surfaces requiring brighter visibility from long distances, such as road signs. Retroreflective technology is continuously being pushed forward by evolving safety needs across many industries. This innovation has been witnessed through the integration of LED light sources, which enhance visibility at an even longer distance than glass beads and microprismatic material alone. What’s more, applying retroreflectivity during the daytime is currently being explored—creating additional opportunities for visibility in the future. It’s essential that companies research the proper standards for their industry and audit the application of retroreflective materials in their workplaces.